Okay, so it wasn’t a hammer, but a sword — and it was only on loan from one of the gods. I’m referring to the weapon which plays a singing role in the final movement of Sibelius’s “Kullervo.” My review of last night’s concert has just gone live at Classical Source. My review is live at ClassicalSource. The artists playing the mystery track of Sibelius‘s Tapiola? 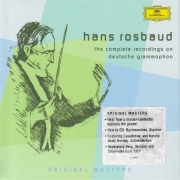 The Berlin Philharmonic conducted by someone more closely associated with Bruckner, Mahler and the Second Viennese School – Hans Rosbaud, from a studio recording for Deutsche Grammophon made in 1957 – just before the label began stereophonic recordings. Mystery Track: Who’s the Maestro? Here’s a remarkably atmospheric pre-stereo studio recording of Sibelius‘s Tapiola. Can you guess the conductor (and orchestra)? All will be revealed at 1500 EST on July 17.